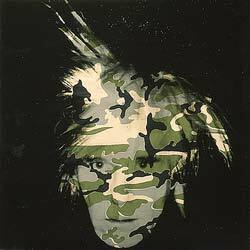 The Camouflage Self-Portrait is a work that was completed in the year 1986 by Andy Warhol, who was an American artist. This work was a self-portrait that he completed in the month of February before his death. In this self-portrait, Andy Warhol used a Polaroid photograph of himself as the base. He used an acrylic polymer paint and silk screen printing to create a camouflage effect across the surface of his self-portrait, which is surrounded with black. The effect of this interesting technique is that this self-portrait appears as though Andy Warhol’s head is floating in a large area of black space. It is a haunting, extremely moving piece of work. The portrait itself is so personal, but with the added effect of the military camouflage across the face of it appears to add a great sense of danger, and impersonality. Andy Warhol really took two completely different looks and drew them together to create something truly fascinating.